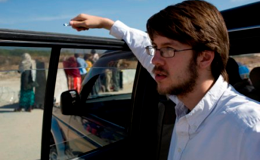 Scholars Alex Strick van Linschoten, 28, and 32 year old Felix Kuehn have swapped the musty libraries of London for the dusty streets of Kandahar, spiritual home of the Taliban. There the two have lived for almost five years, engaging with those many call the enemy in an effort to further understanding. Their research has resulted in two outstanding books. An Enemy We Created: The Myth of the Taliban/ Al Qaeda Merger challenges the orthodoxy that the two militant organisations are much alike. Understanding any distinction may be critical if tentative peace moves with the Taliban are to have any chance of success. 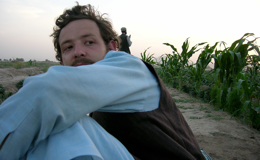 Next month the duo is also publishing Poetry of the Taliban, containing more than 250 translated poems written by Afghan Taliban fighters which presents them in a rarely-glimpsed cultural context. The Bureau recently met up with Alex and Felix to discuss their work, and how drones are viewed by the Afghan Taliban. We began by asking them about their forthcoming collection of poems. Alex: The whole point was to present things which you wouldn’t normally read, just the usual stuff that gets translated into English. I was on the Taliban’s website looking at its navigation bar. First place is a link to news, you know, ’30 infidels were killed in Sangin today’. Second is opinion pieces. Then the number three button is the songs. We thought, this is interesting, page after page of poems. Q: That’s something we’ve not seen in the west, the idea of a cultural Taliban. Felix: Not a lot of people pay attention to this. And one of the interesting things is that everything else is tailored messaging, very strong propaganda at which they’ve become very good, who is your target audience and tightly structuring your messages. But this is just really guys who write poetry and are Taliban, and then talk about issues they relate to, in sometimes very artistic fashion, in sometimes very simple language. And on a very wide range of subjects. I think also that the Taliban poetry thing had a very different quality when we moved down from Kabul to Kandahar. Because even though a lot of our friends aren’t pro-Talib at all, they would have these tapes with these songs, and would listen to it all the time and it would be on always. Q: Do people still listen on tapes, is it the older technology? Felix: There are still tapes sold, for the taxi drivers. Though many have upgraded to MP3 players now. But still the same poetry on them. Alex: It’s all part of this cultural or aesthetic element of who the Taliban are. Normally we think of the Taliban as a religious group, or a political or military group. But going back to the 1980s and 1990s, this was part of who they are. And people associated it with them quite closely. It’s definitely one of the things I think about, the ways I try to understand who these people are. If you’re not reading this stuff you’re missing a big part of them. They’re guys who sit around and talk and joke and have conversations. It’s a different aspect of their identity. Felix: I’m often reading these reports by people who have massive access and financial resources, and get all of this stuff translated, and you can find lots of interesting facts in there. But then you re-analyse this and it often lacks a certain understanding I feel of these people they’re talking about. If you’re not reading this stuff you’re missing a big part of them. They’re guys who sit around and talk and joke and have conversations. It’s a different aspect of their identity. Felix: Right, the substance. Something we see or have seen a lot on a daily basis living in the south and going to the villages and attending tribal shuras and all these little bits of conflict and social life and fabric, you get a feel for it which informs everything you read afterwards. When I read a story about something that happens in southern Afghanistan, I’ll read it completely differently from how I would five or six years ago. When I didn’t understand that things can be far more complicated than you see on the surface. And I think that the poetry, for a lot of people, will be a really interesting experience because they’ll be forced to identify more with the people, even though they may naturally have an anti-Taliban, this-is-our-enemy sort of approach. They’ll see that it’s not just the super-fanatics who are always just about jihad. Q: How are drones viewed in Kandahar, how do they affect peoples’ understanding of the conflict, and how are they perceived? Alex: In the south they have, at least up until I was last there in October 2011, a far less… It’s not like the east where you really feel them as a presence, where everyone will have a photo on their cellphone of a drone they took last week. 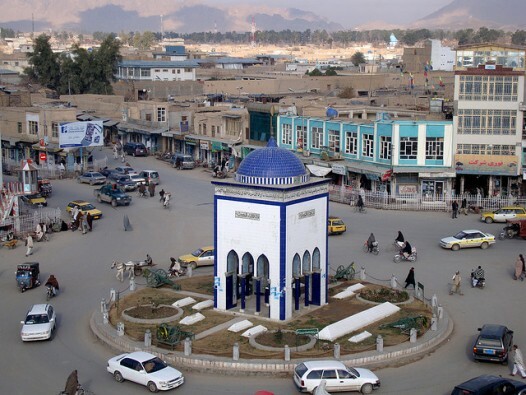 There’s just not the traffic, at least in the city, and I don’t think in the districts as well from what I hear, compared to the east or compared to FATA. It’s not that visceral a thing really, not a big discussion topic. Sometimes you’ll be sitting outside and there’ll be a drone flying over and it’s ‘Oh yes, there’s the drone, fine‘. There is also this big blimp over Kandahar, and when it first went up no-one would let their wives sleep outside, ‘It’s the Americans trying to view our naked wives’. No one can be blamed for what happens. Each man is passing through a time of testing. One is hopeless from poverty. They accompany the non-believers elsewhere. Grant a little modesty and zeal to Muslims. Muslims be granted dignity in all things. Felix: There’s not too much discussion about it although there is quite a presence, specifically over the city. If we sleep outside there’s always a drone flying, but they’re surveillance drones, not armed Reapers. Alex: They do conduct drone strikes in the south. Felix: For example the time one of our friends salvaged one, in 2007 or something, there were a whole bunch of pictures, a barrel full of parts which I think they sold back to the Canadians. You can definitely see drones on the US airbase. I remember seeing the first drone there and being excited, looking out of the airplane, there were maybe two or three in one corner. And now you drive by and they have maybe fifty? Every time I land at Kandahar there’s a drone landing before or after us. As to strikes: when troops call in air support and it’s a Reaper, I’m not sure those on the ground would really notice the difference. It’s just ‘the air strike’. So there’s probably far more of this going on than people realise, they’re just getting used to it. Q: And is there an empathy with what’s going on in FATA, is it in the poems, or is this really just a Pakistan thing? Alex: I’ve been through the poems looking for references and it doesn’t really come up. The cultural universes of Taliban poems, the songs of the Pakistan Taliban, they’re far more tightly controlled. Interestingly this is another argument to support their being different groups, because the way they go about the songs is different operationally. In Pakistan it goes through a strict production factory, more or less, to make sure the poems properly represent the line they want to take. It’s much more a propaganda product than the stuff that the Afghans come up with. And in the 260 poems we have in our collection there’s not a single mention of drones, and these are poems taken from the south east as well as the south [of Afghanistan]. In the 260 poems we have in our collection there’s not a single mention of drones. The only thing which comes up and does so twice is the image of Ababil, the green bird, which is a Koranic metaphor for when Abraham is fighting against Nimrud and God sent the green birds to support him. This, I know from talking to Pakistani journalist friends of mine, comes up quite a lot in the drone literature of the Pakistan side, the green birds. The two are often paired together in curious ways. But it’s not really used that way in Afghanistan… Drones don’t really feature in the cultural or aesthetic. Obviously in the videos which come out, which are coming from the east, you’ll have the drone animations and things like that. But that’s coming from the contact with the Pakistanis.